With passenger vehicle sales taking the slow lane in Q2 of FY2019, India Auto Inc has witnessed some tough times of late, aggravated by rising fuel prices which have clearly had an impact on UV numbers. With the PV segment cumulatively clocking sales of 2,028,529 PVs between April and October 2018 (April-October 2017: 1,911,883 / +6.10%), UV sales are moderating at single-digit growth of 5.19 percent with overall volumes of 546,833 units (April-October 2017: 519,849). Fuel prices, which touched as high as Rs 91.34 a litre in Mumbai on October 4, and diesel soaring to Rs 80.10 a litre on the same day, buyers have turned conscious about the need for higher fuel efficiency, leading to a shift in trend to frugal sedans and hatchbacks. As a result, passenger cars at 1,354,897 units comprised 66.79 percent of total PV sales between the April and October period, posting a 5.87 percent growth rate (April-October 2017: 1,279,783). While UV sales have been slow across manufacturers, the sole player which has been a consistent outperformer is Tata Motors, which has managed to simply double its UV market share in a time of changing buyer preferences. The compact reason for this performance is its Nexon crossover. The stylish UV, whose styling bears Tata Motors’ ‘Impact’ design philosophy, has given a strong push to the company’s UV volumes. The value-for-money compact SUV has cumulatively sold 34,610 units between April and October 2018, recording a surge of 285 percent (April-October 2017: 8,982). The Nexon was launched in September last year. Led primarily by the Nexon, Tata Motors cumulatively saw overall volumes touching 43,447 units in the April-October 2018, up 120 percent (April-October 2017: 19,737) and helping the company to more than double its UV market share to 7.95 percent, which was 3.80 percent a year ago. 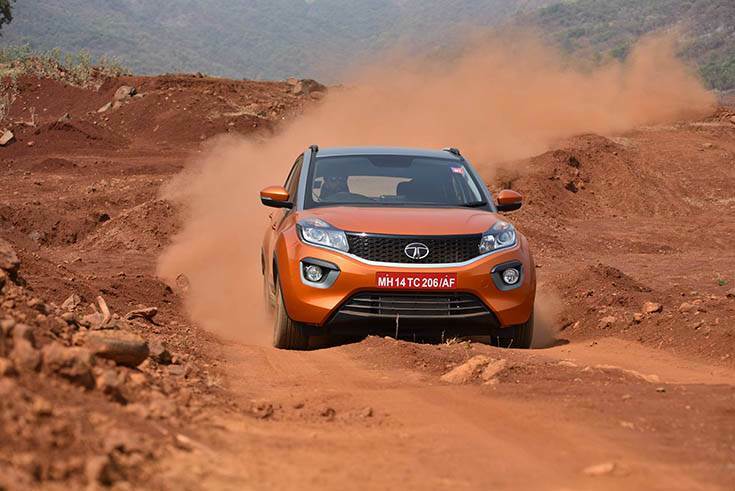 The Nexon contributed almost 80 percent to Tata’s overall UV volumes in the seven-month period, with the Hexa and the Safari Storme aiding its cause. Offered both in manual as well as AMT options in both petrol and diesel engine variants, the Nexon squarely targets the Maruti Vitara Brezza and the Ford Ecosport, and comes across as a well priced contemporary alternative to the two. Tata Motors is now gearing up for the introduction of its all new mid-sized SUV – Tata Harrier – which is based on the Land Rover Discovery platform. The Harrier will come with a 2.0-litre diesel engine option, and is expected to be out at the start of the next year. Another solid performer in the UV space has been FCA India, which is playing it well with its popular Jeep Compass SUV. The Compass has turned the fortunes around for FCA in India since its launch in July 2017, and has sold 9,753 units between April and October in the current fiscal itself, registering a growth of 29 percent (April-October 2017: 7,561). 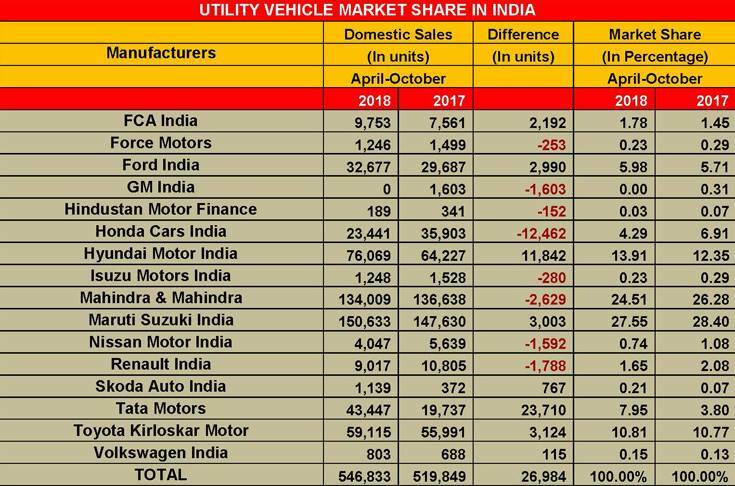 As a result, FCA India has seen an increase in its UV market share, which has grown from 1.45 percent last year to 1.78 percent between April and October this year, driven singlehandedly by the Compass. Ford India too saw an uptick in its UV sales with its volumes cumulatively touching 32,677 units over the seven-month period between April and October (April-October 2017: 29,687), thus, marginally increasing its market share from 5.71 percent to 5.98 percent. While the EcoSport compact SUV, which was given a facelift in November last year has played a major role in driving this growth, Ford also introduced the Figo-based Freestyle crossover in April, which has brought some decent numbers as well. The EcoSport sold 29,359 units during the review period, registering a growth of 16.46 percent (April-October 2017: 25,208). Ford’s Endeavour, its Toyota Fortuner-rivalling SUV, on the other hand, recorded de-growth of 26 percent with sales dropping to 3,318 units (April-October 2017: 4,479). Toyota Kirloskar Motor, on the other hand, saw sales of its Innova Crysta MPV and the Fortuner SUV drive growth in the UV segment, going to 46,047 and 12,966 buyers respectively. While the Innova is up 11.19 percent (April-October 2017: 41,410), demand for the Fortuner was down by 10.45 percent (April-October 2017: 14,480 units). Toyota however has maintained its UV market share, which today is placed at 10.81 percent with overall sales of 59,115 units (April-October 2017: 55,991 / 10.77%). While Hyundai Motor India has registered an increase in its UV market share, Maruti Suzuki India, Honda Cars India and Mahindra & Mahindara all recorded a decline in UV market share. On the back of continued demand for its Creta SUV, Hyundai saw its UV market share grow from 12.35 percent in 2017 to 13.91 percent between April and October this year, with overall sales of 76,069 units (April-October 2017: 64,227). The Creta comprised 98 percent of its total UV sales with cumulative 75,024 units going home to buyers and registering a growth of 18.55 percent over the period (April-October 2017: 63,280). The Creta was given a healthy makeover in May this year. Maruti Suzuki India, which has otherwise been chugging tepidly in terms of its passenger car sales, saw its UV numbers moderate over the seven-month period, with sales for the quartet of Vitara Brezza, Gypsy, S-Cross and the Ertiga settling at 150,633 units, a marginal 2 percent growth over last year (April-October 2017: 147,630). So, with an increased size of the overall market, Maruti’s UV market share has fallen from 28.40 percent to 27.55 percent between April and October this year. Meanwhile, Honda Cars India also saw sales of its WR-V crossover fall, leading to a substantial decline in its UV market share which dropped to 4.29 percent from the earlier 6.91 percent between April and October 2017, when the Jazz-based crossover was enjoying its heyday. Honda’s overall UV sales, led primarily by the WR-V, stood at 23,441 units, as against the 35,903 units sold during April-October 2017. While Honda has its passenger car models to fall back upon, UV specialist Mahindra & Mahindra, on the other hand, is witnessing a serious phase of trouble with its overall sales declining to 134,009 units, which were earlier placed at 136,638 units. Mahindra’s market share has critically fallen from 26.28 percent to 24.51 percent between April and October 2018. Where sales of its Bolero, Thar and TUV300 dropped 12 percent to 67,817 units (April-October 2017: 77,143), Scorpio, XUV500 and the recently launched Marazzo MPV were up 11 percent to 66,148 units (April-October 2017: 59,491). 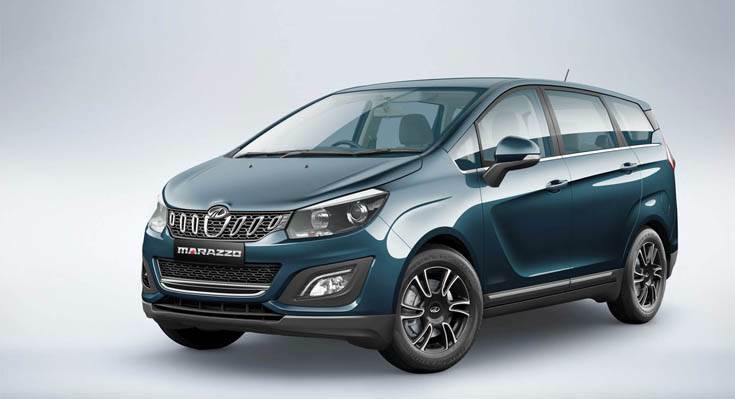 The company claims that the Marazzo has received over 10,000 bookings since its launch in September. The impact of the decline in UV demand could very well be seen in the market share statistics of key vehicle manufacturers in the industry, where even after some posting an uptick in their volumes, have seen a decline in their overall UV market share, hinting at a low margin of growth when compared to the numbers posted in FY2018. “High fuel prices and uncertainty of regulatory environment are the key reasons for subdued demand for cars,” said Pawan Goenka, managing director, Mahindra & Mahindra at the announcement of its Q2 results for the fiscal in Mumbai on November 14. He added that it would be difficult for the company to achieve double-digit growth by end FY2019. While fuel prices playing spoilsport is one aspect, the lowering sentiments towards diesel from an environmental and long-term perspective (life of diesel cars in NCR restricted to 10 years), are also hurting UV sales, where diesel with its ample torque is inherently the better suited fuel for these vehicle types. With some crucial models such as the Tata Harrier and some more from Kia Motors and MG Motor India set to launch in the new calendar year, sales in the UV category might unfold some surprise, albeit, with slow- to- moderate growth. Watch this space.